MK Dons could think themselves unlucky not to win their third game in a row at Stadium MK after drawing 0-0 with Blackpool on Saturday. Seasiders keeper Joe Lumley had an excellent afternoon for the visitors as he kept out substitutes Robbie Muirhead and Ike Ugbo in the second half, while the home side could have come away with nothing had Sean Longstaff done better with his chance at the very death, seeing his strike crash off the crossbar. The result means Dons move within a point of Oldham outside the drop zone ahead of their Thursday night trip to Gillingham. Robbie Muirhead was a surprise inclusion on the substitute's bench after he returned early from international duty with Scotland U21s. 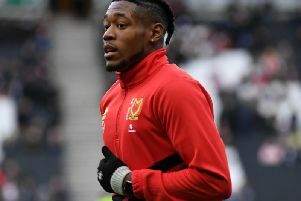 Kieran Agard made his first start in a month as Osman Sow missed out through injury, while Ethan Ebanks-Landell also returned for his first start since February 13. Having started slowly in the two previous games, Dons were equally as slow out of the blocks at Stadium MK on Saturday. The home side were playing some nice stuff in the attacking third, but the killer ball was nowhere to be found. Blackpool barely offered a threat either though, with Kyle Vassell's tame effort straight at Lee Nicholls their only real attempt. When Dons did put their moves together, it was only an instinct save from Lumley which prevented them from taking the lead. Chuks Aneke did really well to bring down Scott Wootton's long ball into his chest, and his ball around the corner picked up by Pawlett, who drew the save from the keeper. Blackpool should have taken the lead early in the second period when Jay Spearing's piercing run over the half way line eventually found Viv Solomon-Otabor but he volleyed over the top. Muirhead's early flight to return to Milton Keynes in time for the game meant he was limited to the final 25 minutes of the game but he almost immediately made an impact with a fierce strike, echoes of his second against Rotherham, but drew a strong save from Lumley. His introduction certainly turned things in favour of the home side, and his ball into the mixer picked out fellow substitute Ike Ugbo who drew a brilliant save again from Lumley as Dons piled forwards in the closing stages. Aneke too forced the keeper into a save when he climbed highest to meet Muirhead's corner. However the best chance came as the clock ticked over to 90 minutes and it fell to the visitors. Solomon-Otabor had the better of George Williams all afternoon, and burst past the full-back, pulling back to substitute Sean Longstaff whose first time effort clattered off the bar and to safety.